In medieval Scotland, most marriages are made to acquire land or strengthen alliances. Rarely, are they a matter of love. Highland warrior, Alaric McCabe, a man of honor and fierce loyalty, knows he must marry Rionna McDonald to secure the alliance with her father's clan that will help the McCabes defeat their enemy and live in safety and peace. The fact that he barely knows Rionna and feels no attraction to her, nor she to him has no bearing on the matter. They both know their duty. But, on the way to formalize the betrothal, Alaric is attacked near the border of the McDonald lands and left for dead, only to be rescued by a woman who will test his patience, his heart, his loyalty and the honor that defines him. The fiercely independent young woman isn't happy about being taken from her home (it's all she has) but, over the winter months, as she continues to nurse Alaric back to health, she slowly finds a place for herself within the McCabe clan as well as a place in Alaric's heart. Love, deep and true, blossoms between them but a heartbreaking decision looms ahead and when word comes of the impending arrival of the McDonald chieftain and his daughter, Alaric and Keeley are both forced to make the impossible choice between their love for one another and their love for, and loyalty to, the McCabe clan. Banks has written another fast-paced, emotional and deeply sensual story that kept me up reading way beyond my normal bedtime. I fell in love with the members of the McCabe clan while reading In Bed With a Highlander and this book only reinforced those feelings. Catching up with them during the course of reading Seduction of a Highland Lass was like a long overdue visit with cherished family and friends. Keeley and Alaric broke my heart and, yes, tears were shed before I finally reached the end of the story but the journey was well worth the tears and I'd happily do it all over again. In fact, I probably will but right now my sights are set on the third and final book of the trilogy, Never Love a Highlander. It will be released next Tuesday, October 25th and I'm happily anticipating being back in the Highlands of Maya Banks' imagination before that day has ended! Andreas Merrick and his brother, Roman, own and run a popular and extremely profitable gaming hell in London’s underworld. That’s not to say that they don’t have their problems. Andreas is hell-bent on revenge against someone from his past (for good reason), so he fends off assassination attempts on a regular basis. When Phoebe Pace boldly walks into his office asking for help and doesn’t leave when he tells her to, Andreas is slightly taken aback. He stared at her. She smiled back. Phoebe needs Andreas’s help. Her father owns Pace & Co., the finest carriage makers in London, but lately, her father’s health has been declining. Because of that, he has been duped into making bad investments that have racked up enough debt to lose control of the company. Combined with her brother’s mysterious disappearance, Phoebe is desperate and knows that Andreas Merrick has the means and the power to aid her. But what starts off as a cry for help turns into something neither can resist. In Total Surrender is another winner from Anne Mallory. Her stories are paced perfectly, full of secrets, and just when you think things are coming together, Ms. Mallory throws in a line that makes you say, What?! –in a good way. Andreas and Phoebe have opposing personalities—he is dangerous and gruff while she is upbeat and happy—yet both are intelligent and fiercely loyal. I love that Andreas is constantly unsettled by Phoebe’s smiles and teasing, but doesn’t become mushy. As Phoebe describes him, Andreas Merrick is an intense man, but ruthlessly fair. I enjoyed seeing Roman (from One Night is Never Enough) again and the scene between he and Andreas upon Roman’s return from his honeymoon is priceless. This book had a lot of great lines, but my favorite is from Andreas’s POV while kissing Phoebe: Could it be called a kiss, this meeting of skin where one person pulled the soul from another? Beautiful. As is this rest of this incredible story. I highly recommend it! Criminal Investigations Division agent Kelly McQueen is called to investigate the death of a solider during a live ammunition training exercise on the local Army base. The officer over the training exercise, Captain Phil Thibodeaux, is certain there must have been a lapse in the safety check during the exercise. But Agent McQueen has a gut feeling that something went wrong, terribly wrong, and she is pretty sure it wasn’t an accident. Upon meeting Agent McQueen, Captain Thibodeaux wonders if she is the right person for the job. While her no-nonsense approach and business-only manners may work in some investigations, this particular one involves the loss of one of Captain Thibodeaux’s own men. So it not just business, it’s personal. Captain Thibodeaux has had enough of business-minded women, beginning with his career-driven mother who didn’t care for the little boy she left at home during those long days as the office. Agent McQueen has spent her career in the military dealing with soldiers and officers full of male attitude. Add to that feelings of abandonment and bitterness towards her nearly non-existent, deadbeat father and you can see why Kelly is all about her work. She knows she can only count on herself. As the puzzle pieces of the investigation begin to fall in place, the close working relationship between Captain Thibodeaux and Agent McQueen grows more personal and feelings slowly arise to the surface. Both are unsure how to acknowledge the bud of love blooming, but when danger encircles Agent McQueen and evil suspects come to light, they both realize they need to lean on each other and on God. This is a wonderful romantic suspense! And though there is intrigue and evil throughout the story, it is also filled with sweet moments between the hero and heroine. While Ms. Giusti keeps you guessing the identity of the murderer, she generously sprinkles the novel with touches of faith that adds richness to the story. What are you reading these days? Any recommendations? I am reading a lot of Neil Gaiman right now. NEVERWHERE was brilliant & I am just about to read CORALINE & STARDUST. I haven't read any of his books yet, Marybelle but I've been thinking about giving them a try. Publisher's Weekly raved about the audio version of NEVERWHERE, which is narrated by Gaiman himself. I am reading a new author right now and stayed up way, way too late last night.....LOL Liver Let Die by Liz Lipperman is a cozy mystery and the author had me sucked in from the beginning. Haven't finished it because I am too old to stay up all night reading anymore but if my brain hadn't turned off about 2 this morning I would have finished it in one setting. I haven't read any of those books yet either but I saw Scottish and medieval and proceeded to put that on my must have list. Anne Mallory I have read before and will have to have that as well. Then The Captain's Mission scrolled up and in my mind I am thinking "Ohhhhhh nice, NCIS in book form??? Gotta have it!" These books look like terrific reads and I'm going to add them to my Read List. Currently, I'm reading "Heat Wave" by Nancy Thayer. It's a story about a newly widowed woman left with two children and little monetary resources who finds the strength to build her own business and find happiness again. I am reading SAVOR THE DANGER right now. It is hot so far..
Dianna, I'll be checking out Liver Let Die (awesome title! )by Liz Lipperman. I love books that keep me reading late into the night! My favorite book that I have read lately has been Maya's book Seduction Of a Highland Lass, loved this book and can't wait for the next in the series that comes out next week. I liked In Bed With a Highlander a lot less than PJ did. The first time the heroine blurted out her thoughts it was cute, but by the tenth time, it was somewhat tedious. Then don't even get me started on how many times the word laird was used. :) The author could have used other references for Ewan, besides constantly citing his title. It's an exageration, but it felt like every other word. I may still give the next book in the series a try though, because the writing itself was good. Right now I'm reading an arc I won, A Lady Awakened by new author, Cecilia Grant. Correction: That should be "exaggeration." Those are three good looking books! I'm reading Susan Mallery's books set in Fool's Gold - I'm on the 3rd one 'Finding Perfect' - loved them! Looking forward to the rest of the series! Then The Captain's Mission scrolled up and in my mind I am thinking "Ohhhhhh nice, NCIS in book form??? Gotta have it!" Dianna, I hope that you will give THE CAPTAIN'S MISSION a try. It is a great read. Connie, this sounds like a really interesting book. I may have to check it out. I'm going to check this one out, Connie. Thanks for the tip! Deerdoe69 said, I am reading SAVOR THE DANGER right now. It is hot so far.. I haven't read any of the books in this series yet. Are you enjoying it? I haven't heard any buzz about A Lady Awakened yet. Are you enjoying it? Di said, Those are three good looking books! I'm reading Susan Mallery's books set in Fool's Gold - I'm on the 3rd one 'Finding Perfect' - loved them! Looking forward to the rest of the series! Janga has had good things to say about those books, Di. I haven't started the series yet but I'm a longtime fan of Mallery's work. 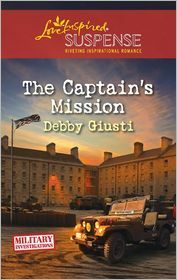 Buffie thanks for the great review and kind words about THE CAPTAIN'S MISSION! So fun seeing you at the Moonlight and Magnolias Conference earlier this month. You Romance Dish girls always look so cute in your matching shirts! Love your blog too! Right now, I am trying to get caught up on Katie MacAlister's Dark Ones series. Love those vamps! Thanks for stopping by Debby!! It was such a delight seeing you at M&M too. Congrats on the release of THE CAPTAIN'S MISSION. After watching Tessa Dare's hilarious book trailer, I definitely have to check out Maya Banks' new trilogy! And I have heard great things about Anne Mallory, so will have to add her to my TBR list as well. WOW, what a great batch of books! I am trying to read an ARC of DEVIL'S KISS by Zoe Archer, but had cataract Monday and have to reading vision in one eye. I had a large print copy of RAWHIDE RANGER by Rita Herron (Harlequin Intrigue), so started that . Still slow going. Thinking positive, I bought the A TEXAS CHRISTMAS by Thomas/Broday/Miranda/Pace and look forward to reading it for the holidays. I'll see my regular eye doctor this week and get a new lens in my glasses. Hopefully by the weekend I'll have new glasses. The eye strain to read and use the computer is too much. I miss my books, and now you have given me more to look for. These all sound good. I just finished Raeanne Thane's Blackberry Summer.It reminded me of Debbie Macomber's . I liked it. I'm reading for college, sadly. I have three books to finish for my Latin American literature class tomorrow, but they're very interesting reads, so I can't complain much. Pity I don't have the time to read them all. Hopefully when I have some time, I'll start reading Tessa Dare's latest book. Librarypat, I hope your eyes continue to heal and you're back to full reading strength soon! Laurie G said, These all sound good. I just finished Raeanne Thane's Blackberry Summer. I'm a longtime fan of RaeAnne Thayne. I just picked up her new Harlequin SE, Christmas in Cold Creek yesterday. I also enjoyed Blackberry Summer and am looking forward to Book 2, Woodrose Mountain which will be out in April 2012. Antonia said, I'm reading for college, sadly. I have three books to finish for my Latin American literature class tomorrow, but they're very interesting reads, so I can't complain much. Glad that at least they are interesting reads, Antonia! Tessa's new book, A Night to Surrender is an excellent choice for your re-entry into pleasure reading. Hope you enjoy it! Sandra Lynne said, WOW, what a great batch of books! I read about Kate Walker's book over at Romance Bandits this week. Glad to hear you're enjoying it! PJ: "I find it fascinating how two people can read the same book and come away with such diverse opinions but it happens all the time." I agree. Highlander had so many good reviews that it's disppointing not to have enjoyed it. As for A Lady Awakened, so far it's very good and the cover is gorgeous.